Bang & Olufsen over the past week has added AirPlay 2 support to more of its speakers, including the BeoPlay A9 and BeoPlay M5. This follows the addition of AirPlay 2 to the BeoPlay M3, BeoSound 1 and 2, BeoSound Core, and BeoSound Shape earlier in November, to be followed by the BeoPlay A6, BeoSound Essence, and BeoSound 35 by the end of December. AirPlay 2 should be enabled as part of an automatic software update for each speaker, but the software version can be checked and updated manually via the Bang & Olufsen app for iPhone and iPad if necessary. With the AirPlay 2 update, these Bang & Olufsen speakers now support multi-room audio when paired with other AirPlay 2 devices, such as the HomePod, Apple TV, Sonos speakers including the One, Beam, Playbase, and second-generation Play:5, and select Denon and Marantz audio receivers. 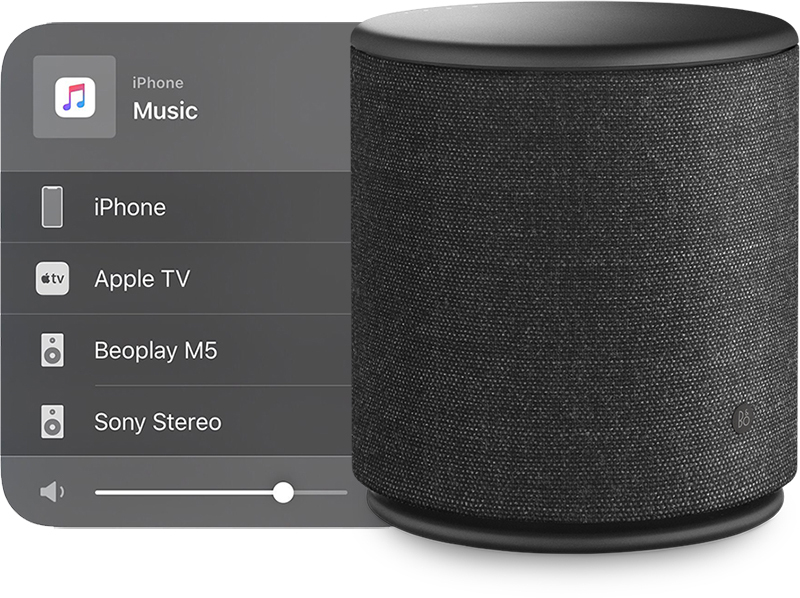 AirPlay also allows for Siri control of Apple Music or Podcasts playback on supported speakers via iPhone, iPad, iPod touch, HomePod, and Apple TV. Bang & Olufsen speakers will appear in the AirPlay device picker within most apps and in Control Center on devices running iOS 11.4 or later. AirPlay is Apple's wireless streaming protocol that enables users to easily stream audio from iTunes on a Mac to supported speakers, as well as from iPhone apps like Apple Music, YouTube, Spotify, Hulu, and Netflix, to AirPlay-enabled speakers, now including these BeoPlay and BeoSound options. As I wrote in another post here a few days ago this is not a solid firmware release for the BeoPlay A9... I’ve tried it for a few days now and the firmware is very unstable in its current revision. Music drops. Volume ”get stuck” and won’t change. My opinion is that the new firmware revision is worse now when using iTunes on Mac. Mac didn’t need AirPlay 2 to work with more than one speaker (only iOS needs that) and the BeoPlay A9 has problems connecting to AirPlay 2 using iTunes on Mac. This revision feels like a step backwards for Mac users until a more stable version is released. However, it seems to work fairly well with iOS. Let’s hope for a more stable version real soon. I've long suspected Airplay 2 was just a software shakedown of my pocketbook and not any sort of change in hardware spec. Shameful of the other MFR's and Apple. I can't speak for A9, but I have M5, rather had. M5 is a great looking speaker with big bass, but that's pretty much the only good things I can say. M5 is strictly mono. Unlike HomePod, you cannot buy two and get stereo sound. And while the bass is impressive, it's very unnatural. It has a bunch of settings to improve things a bit, but you need to use crummy app. Even then, I really didn't find it to be "sound better than anything Apple." I sold M5 shortly after getting HomePod. Now rocking two in awesome stereo sound. I think AirPlay 2 is a mixed bag. I was pretty psyched when the AirPort Express got updated to AirPlay 2 but immediately after updating my firmware I saw a huge loss in responsiveness. Lost connections, difficulty connecting... for the first time I found myself having to reboot the AirPort Express to get it back on the network. It was a drag. And the only real benefit (multi-room audio) is, as you point out, something iTunes has been able to do for years now with AirPlay 1. Streaming to multiple rooms from an iOS device is an edge case at best for me, and not nearly worth all the flakiness of AirPlay 2 -- at least on that device. I have two AE running on my network and I don't experience any issues. Having them running wired ethernet is the only way to go, at least for me. I turn off the network on them, their sole purpose is to relay Airplay. I've found ever since Airplay 2 was released that the interface of speaker selection in iTunes has been buggy, the way it reorganizes / alphabetizes each speaker if its selected is a real drag. Selecting one speaker turns off all the rest or the audio will just fall off. Like you said, controlling from iOS is a mess. Its been iTunes for me since day one. So much easier.